Internet offers many allergy resources for US States. Examples are pollen.com providing allergy forecasts for US zip codes and American Academy of Allergy sources of allergy levels reported by certified counting stations. Weather.com features pollen maps too. Neither of these sites, however, tells anything about Alaska and Hawaii. Actually Alaska's Aerobiology is similar to Northern Europe, with some tree patterns resembling northern states of US. Pollination of poplar - food for honey bees - starts in April - as in Michigan. Birch is very high in May - as in Russia and Scandinavia. Grass is active in June and July. A core pollen season of prophylactic and clinical urgency in Fairbanks and Anchorage is defined from May 10 to June 5. 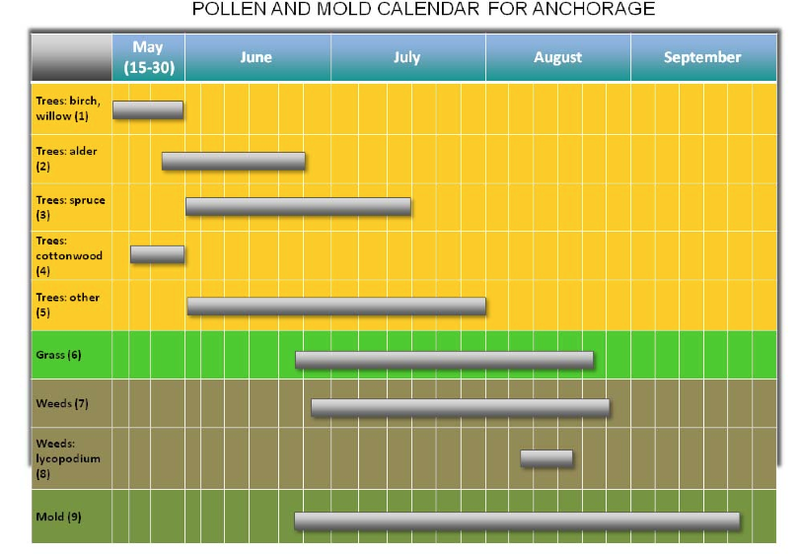 You may want to visit Anchorage Daily news site and Anchorage Pollen and Mold Reporting or Fairbanks area report to find today' allergy information for Alaska, or check Dr. Anderson's calendar below. It is based on the observations made for six seasons: 1982-1987, from three sample locations in Fairbanks area, but represents a good prototype for other parts of Alaska. This pollen calendar shows the range of possible atmospheric pollen concentrations for late April through July, assuming the weather is relatively warm, dry, and breezy. awesome Showbox allows it's individuals to watch as well as showboxdownloadi.com Virtually everyone has a mobile phone as well as great. A checklist of outcomes Kodi for Android will certainly be provided, kodi download click on Application & Gamings kodi for android and choose Downloader app kodi apk download and installAfter totally mounting, Open to introduce. kodi app Enter the link for Kodi Jarvis, or for Kodi Krypton.